Well balanced suspension with a swashbuckling appearance. Made of beautiful top grade leather 4.5cm wide. Period – Early B.C. Celts to well after the Renaissance. Used extensively during Medieval times. Then the warriors preference to comfortably carry a sword. Includes a frog hanger to fit all scabbrads. 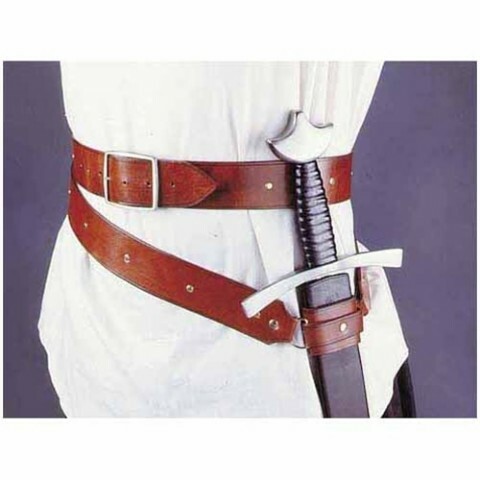 Extra length of belt wraos around the body a second time allowing both hips to support the weight of the sword. Available in brown and brass or black and silver studs and buckles. Sizes: S = 28 -35 inches, M = 33 – 40 inches, L = 38-45 inches, XL = 43 – 50 inches. Prices quoted are inclusive of GST. Delivery charges apply. The quality of the sword has exceeded all expectations. It is in my view, an accurate replica of Ulfberht sword which has been on my bucket list for a long time. This is a perfect start to my collection and I look forward to purchasing from you in the future. Sword arrived today. Absolutely brilliant. Thanks very much. I have received the Scottish Battle Sword and it exceeded my expectations. It’s very impressive! I look forward to purchasing more items in the future. I have bought many swords from all over Australia. I have imported swords from Canada, America & the UK, and yours is the first I have ever received that was A1. Even the small trivial things were perfect, such as a snug scabbard, with no marks on the leather covering and as for the sword itself WOW AWESOME right down to the rivets. I have no hesitation in recommending your site to anyone looking to buy a sword, be it their first or just another addition to their armoury. The Viking King sword arrived yesterday and was awesome. Thanks for the help. My son is absolutely delighted with his sword. I am sure he will be ordering more from you later. Just got the sword, it is fantastic. Could not be happier. I’m eagerly awaiting the next one now. Many thanks for the speedy service and quality goods. All received in mint condition. I’m delighted with the sword and am very happy with it. I hope to add to my new collection in the near future. My order arrived today, both items look great, very happy with my order. Thanking you for the quick shipping too. The machete arrived last week in superb condition. Excellent delivery and prompt service overall. Many thanks. I have received the sword and we used it for the first time this week at our parade. Thank you, we are all very impressed! I will spread the word here in Sydney and keep Sword World in mind for further orders. I am very happy with the pace stick. Thank you. Thank you for your services. The scabbard was a perfect fit. The sword is beautiful and I am extremely happy. Thank you once again for all your help. I will certainly be letting anyone who is interested know where I purchased it from. Your quality of service is outstanding. I saw the sword was delivered today, and it is brilliant! Thanks for the work you have done, everything has been top quality, we are very very happy. The dirk arrived today, thanks very much. It is beautiful! I’m sure to shop some more on your wonderful store! My pace stick has arrived as ordered. It looks fantastic. The quality is astounding, Thanks very much. The sword arrived today and as far as I can see it is in perfect condition. It is truly magnificent and thank you so much for your rapid and incredibly efficient service. It has been a pleasure dealing with you. Thank you for the beautiful CSM cane. My son said he will treasure this wonderful gift. Many thanks again for the prompt service. Your efforts and your product facilitated an incredibly wonderful experience for our family and friends. We are totally thrilled not only with the stunning craftsmanship of the sword but the fact is we now have an engraved and personal keepsake to stay in the family. I’m so glad I literally stumbled across your website. The sword arrived today, many thanks. Looks great! Just to let you know that I received the 3 x minature swords in presentation boxes. Have viewed one and it looks wonderful. My pace stick arrived safe and sound. You are right- it is a fantastic piece. I was really impressed with the CSM cane that I bought a while ago. So much so that I have ordered another one. Thanks very much for your support. We will be sure to pass on to our friends that Sword World has given us excellent service. I brought home my Basket Hilt sword and showed it to my wife. She said WOW!!!! just like I did. It’s a real beauty, I’m very delighted and happy with it. Thank you Sword World. I am happy to inform you that the sword has arrived and I am very pleased. Its beauty is without match and sits handsomely amongst my collection.